Longing for agate, kyanite, pietersite, bronzite, rhyolite, sodalite, jaspers, mookaite, lapis, turquoise, chrysocolla, charoite, lepidoliate, fluorite, green aventurine, red aventurine, smoky quartz, clear crystal quartz (also called rock quartz), rainbow hickoryite, sardonyx, labradorite, amethyst, milky aqua, Russian amazonite, pyrite quartz, rutilated quartz, rhodocrosite, jade, carnelian, Botswana agate, chalcedony, mother-of-pearl and freshwater pearls? Wow, that's a long list! Do you love jewelry designs that are bold while being a bit more styled than usual? Jewelry that is sophisticated in a unique sort of way and always oh-so-wearable? Stop...my head is spinning! My thinking: The woman who is chic is always a little bit different. And, that is the woman I have in mind as I sit in my studio and design. And, if you answered yes to a longing for the gemstones above, there's a good chance you'll find what you like right here. It's no secret -- I am drawn to rocks and minerals from the earth and about eighty percent of my jewelry designs incorporate real gemstones in some way, shape or form. But, there is one big difference with my designs versus the run-of-the-mill designs in the marketplace. That difference is mixing it up a bit. 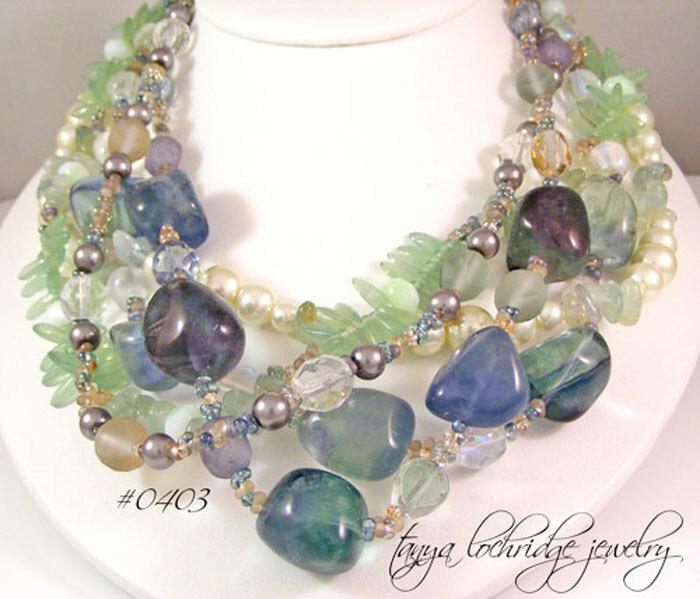 I love to step away from the expected and toss fabulous gemstones with magical vintage Czech glass and baroque freshwater pearls just to see what comes from the adventure. In case you wondered, all pieces are hand-assembled right here in my studio in Oregon. 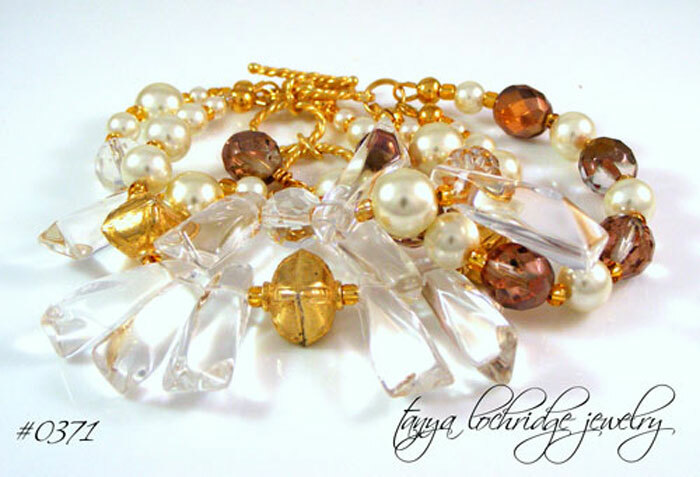 Just an example -- crystal quartz and gold vermeil play really well with Czech glass beads in this bracelet...don't you think? Thanks for coming around and taking a little look-see...you're always welcome you know. The good news is that our door is always open! Designs are added frequently, so make sure to check in often. If you haven't done so already, join our mailing list so you'll know when new goodies or promotions come along. Meanwhile, I'm happy and so grateful you are here sharing this adventure with me.